On the run from the mob, two unemployed musicians, Jerry (Jack Lemmon) and Joe (Tony Curtis) don drag and infiltrate the band. Scored by Alfred Deutsch and arranged by Matty Malneck, the film’s soundtrack also features songs including Running Wild, I Wanna Be Loved By You and I’m Through With Love. One of the film’s funniest scenes has the ‘Sweet Sues’ throw a chaotic drinks party during an overnight train ride. In later years, McGuiggan joined the Marilyn Remembered fan club and often spoke at the yearly memorial services about her memories of Monroe. Fellow member Scott Fortner has described Penny as ‘a warm and caring person with endearing charm and sparkling blue eyes…a joy to be around.’ Penny would also sometimes play the same trumpet used in Some Like It Hot. 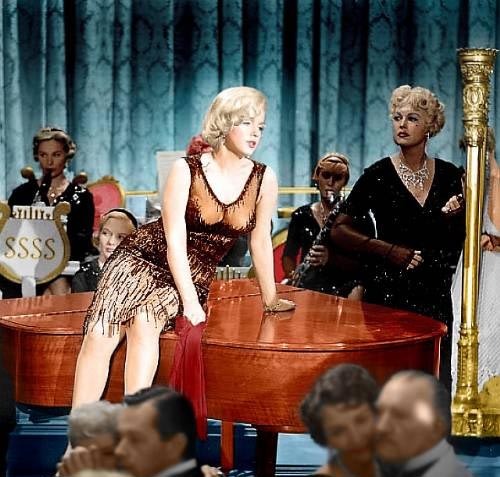 In 2000, members of the American Film Institute voted Some Like It Hot best comedy of all time (it also ranks 14th in their list of the greatest American films.) With the passing of Penny McGuiggan, one of our last remaining links to this comic masterpiece, and its star, Marilyn Monroe, is now broken. A short featurette, Memories Of The Sweet Sues, is included on the special and limited edition DVDs of Some Like It Hot. The ‘Sweet Sues’ reminisced about Marilyn Monroe with the utmost respect and admiration. And Penny herself discussed the legendary star more recently in an upcoming documentary, My Marilyn. Thank you for posting the nice piece on our dear friend Penny McGuiggan who we all loved. She will be missed by many and was a good friend of mine for many years. Back in 01 Penny helped me coordinate a show I was hosting called “The Girls Of Some Like It Hot Pay Tribute To Billy Wilder”. Penny and the other band members were terrific and can be seen online at http://www.harrisonheldstarmedia.com . Let’s keep Penny in our hearts and thoughts. She was a great, generous, warm-hearted kind person. Thank you for remembering my mother. Dennis and I took her to the Hotel Del just two months ago for the 50th reunion of the making of “Some Like it Hot”. She so enjoyed being with the 7 other bandmates and Tony Curtis- and the wonderful weekend event they created at the Hotel Del. She was truly a special person.